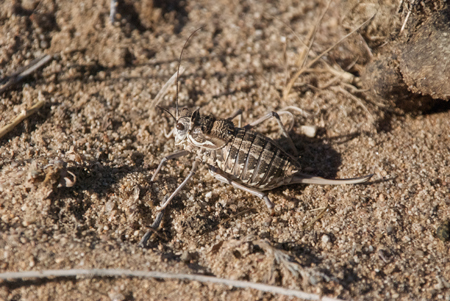 I probably should have run this post last week before Hallowe’en, but, in any case, here’s a variety of the insects that I’ve seen in Mongolia. Not all that many and I don’t know what the species are. 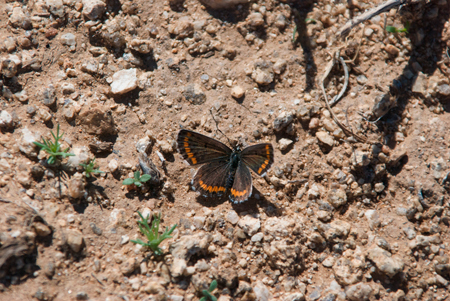 Field guides are kind of thin on the ground for Mongolian wildlife. So if anyone can ID these critters, let me know and I’ll update this post. The photos were shot on my 2006 and 2008 trips. I used a Nikon D70 with a Tamron 28-300mm lens in 2006 and a Nikon D80 with a Promaster (made by Tamron) 28-300 in 2008. 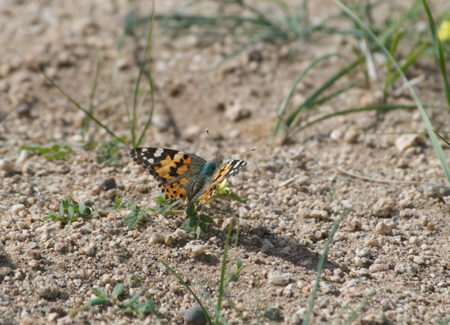 Saw this one in the Gobi. It was big- close to 3″ long. 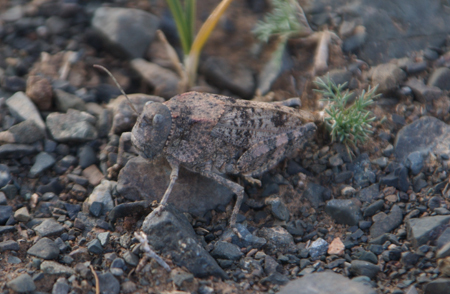 Saw this one at Ikh Nartiin Chuluu Nature Reserve. There were specimens at the Natural History Museum in UB but, unfortunately, the labels were all in cyrillic Mongolian, which I can’t read. Yet. 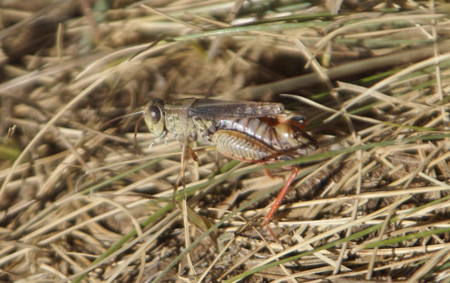 They are related to grasshoppers, but aren’t. That much I was able to find out. 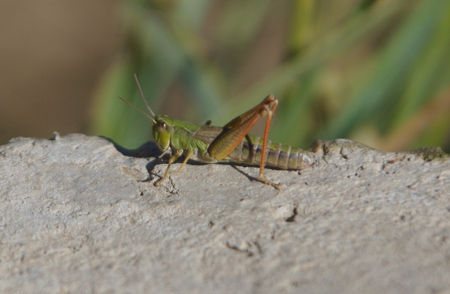 Another grasshopper photographed at Hustai. 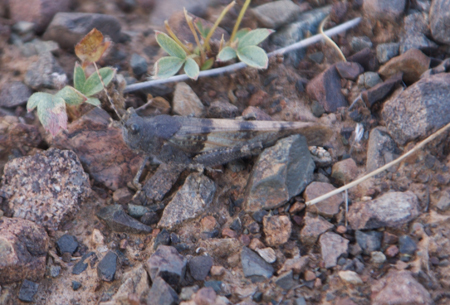 Large, almost 3″ grasshopper photographed near Dungenee Ger Camp, Gobi Desert. Photographed same location as above. This one really matched the rocks. 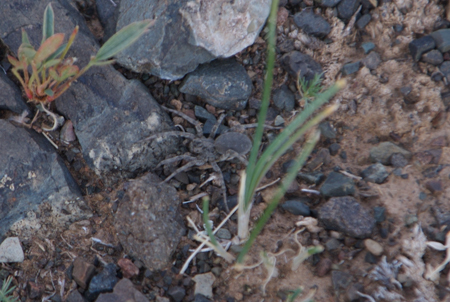 Only spider I’ve seen in three trips to Mongolia. 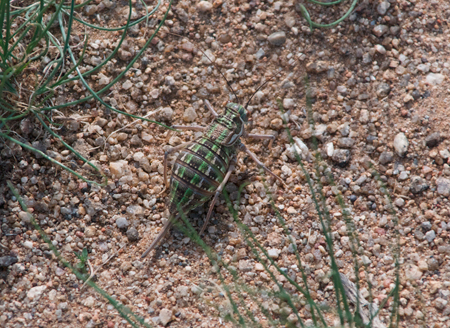 Photographed same time as the two grasshoppers above. Beetle at Ikh Nart. 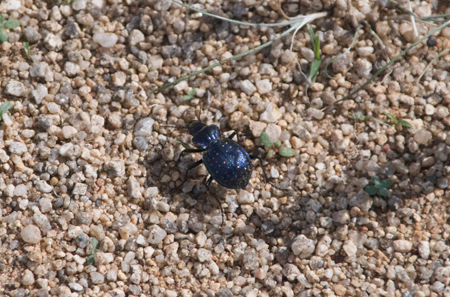 The challenge was waiting until it scurried out into the sun so I could catch the deep blue color. This was really one of the most dramatic wildlife spectacles I’ve seen in Mongolia. 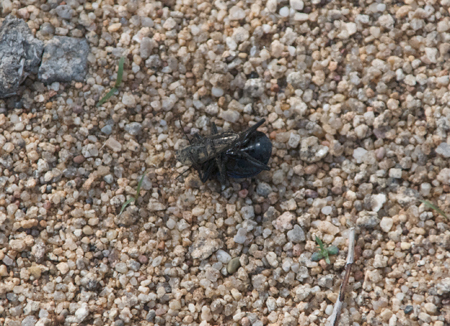 The beetle had pounced on the brownish insect and the battle was on, with the latter trying to escape from the former. The beetle inexorably manuevered the brown one around for what we thought was the death grip in which they were head to head. Then, suddenly, the brown one broke free and got away. It went on for minutes. I took quite a few pictures, but this one seemed to show the situation with the most clarity.